I was recommend this Savvy? dress by Amelia. Specifically this dress. Amelia had bought it (cause let’s face it Savvy has been more her style than mine). She looked at it and thought of me. But unfortunately it is no transfer so I had to go buy my own copy. This is soooo me. Cute little summer dress. And it’s the first thing I’ve purchased from Savvy?. I just wanted to give everyone a quick preview of what you will see tonight at the Second Convention Fashion Show from bossa nova. Morie caught me last night when I had 5 minutes before having to go to the RL job. I promised her I’d do this this morning before I went to sleep. So here they are. These are never before seen dresses that will be released tonight! saudade in blue, without the included bolero jacket [because I forgot and I need to go to bed], has a cute little underskirt that is visible when you turn. 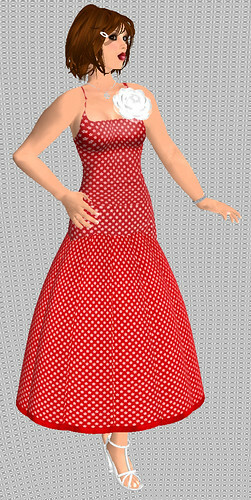 bem querer dress in red has a netted underskirt that is seen when you turn. This is what Morie said about her new releases. This week, on the 12th, we celebrated “dia dos namorados”, the Brazilian valentines day. That was my inspiration for this release, the bem querer (“wishing well” in Portuguese) and saudade (a word very hard to translate – it’s that bittersweet feeling you have when you miss a loved one). The saudade dress comes in pink, beige, brown, olive and a lilac RFL edition (…will be available asap at my main store). It comes with a cream colored lace underskirt and bolero jacket, and a vintage mother of pearl brooch on the chest. The bem querer dress comes in black, white, blue, orange, and a pink RFL edition …, printed with a tiny flower patter (no, it’s not polka-dots 😉 . 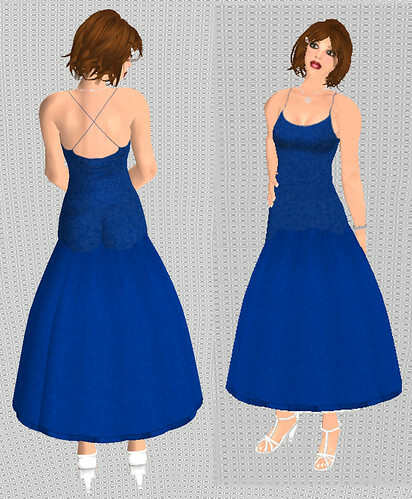 It has a contrasting tulle underskirt and a matching corsage on the chest (tint-able and resizeable). You are currently browsing the Hairapy category at SL Fashion Notes.